Challenge // Betapitch is growing year by year and needed a design language which is highly flexible to adjust on a huge number of Event Branding Products. We decided on a visual language that is build on a variety of icons ready to be used as a huge toolbox. 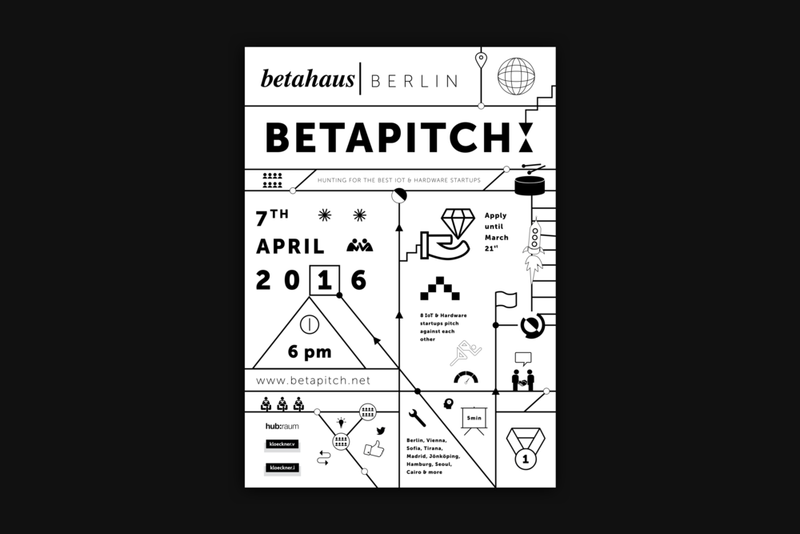 About // Betapitch is a startup pitch event, happening in coworking spaces all over the world. 5 minutes for each of the most promising and ambitious startups to share their visions about developing new business solutions. Local Betapitch competitions are taking place in Berlin, Hamburg, Vienna, Jönköping, Sofia, Tirana, Barcelona, Lisbon, Seoul and São Paulo. All the winners from these cities come to pitch off for the grand prizes at Betapitch | global in Berlin.